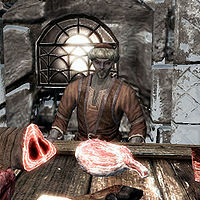 Aval Atheron is a Dunmer pawnbroker and street vendor in Windhelm. He prides himself on his business sense, claiming "I'm as resourceful as I am discreet." He is the only one in the Atheron family who owns a business; his brother Faryl and sister Suvaris work for a local Nord farmer, which Aval sees as an embarrassment. Aval has a house in the Gray Quarter of Windhelm, which he shares with his siblings. Aval's day starts with breakfast at his house at 7am. He finishes his meal in an hour and heads toward his stall at the market in the Stone Quarter. When visited at the market Aval demonstrates a cheerful and a confident attitude: "Assorted fruits and vegetables, all delicious and affordable! ", "Come and browse my fine selection! Everything's fresh and delicious!" Ask him where he gets his goods when working at the stall, he'll tell you: "Wherever I can find them. If you're the type who worries over where something came from, you may want to move on." As much as any Dark Elf, Aval despises the Gray Quarter. If asked about living there, he confirms: "I'm a Dark Elf and I live in Windhelm, so yes, I live in the Gray Quarter. You must be new around here, or you'd know they don't let my kind live anywhere outside that slum." For that same cause he holds a great respect for Brunwulf Free-Winter who tries to reason with Ulfric Stormcloak over "the situation" with Dunmer and Argonians: "Friend Brunwulf, how good to see you! ", "If you see anything you like, just let me know and I'll gladly offer you a discount." At 7pm Aval leaves his work place and visits the New Gnisis Cornerclub. For an hour on weekdays he would join his brother Faryl outside the tavern with his drink. Aval leaves New Gnisis Cornerclub at midnight and heads straight home for a night's rest. If the civil war is won by the Empire, Aval will express his joy for Brunwulf's governing and his anticipation of change. When asked if things have changed because of the Empire, he'll admit: "Well, not yet. The Empire hasn't been in charge for that long, and real change takes time. Still, having a just and honorable man like Brunwulf in charge can only be an improvement. Unlike Ulfric, Brunwulf has shown a great willingness to work with the other races and make us feel more at home here. For the first time in a long while, I truly believe that there are brighter days ahead." Aval wears a set of merchant clothes, a pair of boots, and a hat. He is equipped with an iron dagger, and carries a key to his family's house, as well as a selection of common loot and gold. This is the merchandise found in Aval's merchant chest. These items are only available if purchased from the merchant; they cannot be pickpocketed or stolen. They are restocked every two days. You cannot buy any of the items on display at his stall. This issue has been addressed by version 2.0.7 of the Unofficial Skyrim Patch; he will sell and buy the items on display at his stand. If Revyn Sadri dies, Aval technically becomes owner of Sadri's Used Wares. However, he never takes over running the store; he never enters the store and does not own the store's merchant chest. This issue has been addressed by version 2.0.4 of the Unofficial Skyrim Patch; Idesa Sadri has been tasked with the backup job instead. This page was last modified on 22 November 2018, at 03:45.